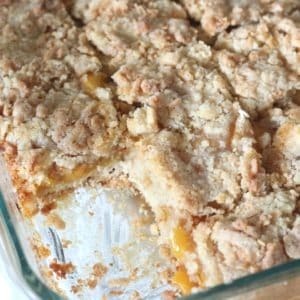 August 2, 2018 0 comments on "Peach Crumb Bars"
It’s peach season again! A couple of years ago we planted a peach tree in our backyard, and we have been really enjoying having fresh peaches from our tree every summer. I’ve been trying out different dessert recipes using peaches. These peach crumb bars are delicious and easy to make. In a small bowl, mix together flour, oatmeal, sugar, brown sugar, and salt. Stir the melted butter, vanilla extract, and egg, into flour mixture. The mixture will be coarse and crumbly. Place about 2/3 the flour mixture into a greased 8×8-inch baking pan. Use your hands to press the mixture down into the bottom of the pan. Bake for 10 minutes. Remove from oven. In a medium sized bowl, combine sliced peaches, sugar, cornstarch, and cinnamon. Spread the peaches on top of the flour and oatmeal mixture. Sprinkle the remaining flour and oatmeal on top of the peaches. Bake 35-40 minutes, or until golden brown. Cool, and cut into squares. 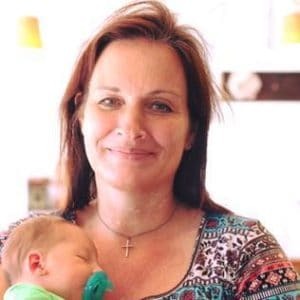 Follow my Creative Homemaking board on Pinterest.